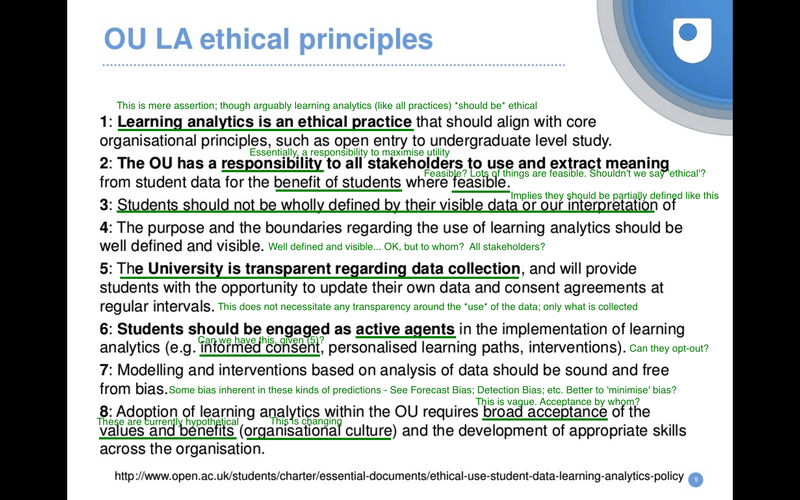 This is just a short blog post to capture some thoughts on the ethical principles of learning analytics as set out in official documentation provided by The Open University. I have attended various briefings at the OU around this subject, mainly because there is a lot of complexity here with regard to the ethical significance of these technologies. I was also a member of the advisory panel for the JISC Code of Practice for Learning Analytics. You can see the original list at http://www.open.ac.uk/students/charter/sites/www.open.ac.uk.students.charter/files/files/ecms/web-content/using-information-to-support-student-learning.pdf. Point 1. It is asserted that learning analytics is an ethical practice, but this has yet to be established. Arguably we should state that it should be thought of an ethical practice, but this is quite different in terms of ethical principle. ‘Ought’ statements are much harder to justify. Point 2. There is a confusing mix of deontological and consequentialist-utilitarian consideration here. Unpicking it, I interpret it to mean that the university considers itself to have a responsibility to maximise the utility of the data about students that it owns. The important points here are that a.) stakeholders are not clearly defined and could include (for instance, privately owned data brokers; b.) there is no acknowledgment of the possible tension between different forms of self-interest; c.) no criteria are given for ‘feasibility’. Point 2. It’s difficult to see how feasibility should be a criterion for whether something is ethical. After all, ethics is something that regulates the realm of the feasible, the possible, the actual. This would be a much stronger principle if this word was replaced with ‘ethical’, or ‘justified’. Point 3 infers that students should be at least partly defined by their data and the university’s interpretation of it. This may not be that contentious to most people, though without clear parameters for the other criteria that are considered it could be taken to mean ‘mostly’ defined by the data held by the university. It’s not clear what this means in practice except putting in some wording to ward off concerns about treating students as nothing more than a set of data points. Point 4 seems right in setting out a principle of transparency in the process, purpose and use of student data. But it doesn’t make a commitment to full transparency for all. Why not? This is brought into sharper relief in Point 5, which sets out a commitment to full transparency for data collection. Taken in conjunction with Point 4, it seems that transparency is endorsed for collection, but not use. Point 6 is on the theme of student autonomy, and co-operation in these processes. These are good things, though claims to have given informed consent are potentially undermined by the possible lack of transparency in use in Point 4. A further possible undermining of student autonomy here is the lack of clarity about whether students can entirely opt out of these processes. If not, how can they be considered ‘active agents’? I’m not an expert in big data but I know a little bit about predictive modelling. In Point 7. the idea is that modelling ‘should be’ free from bias. Well, all modelling should be free from bias, but these effects cannot be truly eradicated. It would make more sense as a principle to speak of ‘minimising’ bias. Point 8. endorses adoption of learning analytics into the institutional culture, and vice versa. It asserts that there values and benefits to the approach, though these are largely hypothetical. It basically states that the institutional culture of the university must change, and that this should be ‘broadly accepted’ (whatever that might mean). The final point I’d make about this is that, for me, these are not generally worded as principles: rather as vision statements or something intended to guide internal decision making. But when it comes to ethics, we really need clear principles if we are to understand whether they are being applied consistently, sensitively, and systematically.